One of the most common questions I get asked in-store is, “what is the best coat for me?”. I usually reply back with, “how many do you want to own?”. Ideally, you will have multiple coats for a variety of situations. So, how do you choose the right coat? A down coat is by far the best insulator on the market. It gives you the best warmth, without the weight. Down is very warm, light weight and packable. Typically, a higher number of down will indicate it’s a warmer down. You will see numbers from 500 to 900. However, the downside is down won’t insulate or keep you warm if it becomes wet and it dries slowly. Therefore, you will need to cover with a water resistant jacket, like a rain jacket, or look into a synthetic option. There are a ton of synthetic options, whether it is a weather-resistant shell, an insulated jacket, or a combo of both (known as a 3 in 1 jacket). The main benefit of a 3 in 1 jacket is versatility. No matter the conditions, you can count on it to keep you warm. The 3 in 1 style jacket is one of our most popular because you essentially get 3 jackets in 1 coat (remember what I said about needing more than one coat!). You have your outer coat that is a shell to block the wind and rain. The inner coat is usually a fleece or synthetic down material. When you zip them up together, you get your warmest option of jacket. The benefit of synthetic down over real down is the ability to dry faster and it also insulates when damp! However, synthetic down is usually a little heavier and less packable, along with being a little less durable. Thankfully with technology, innovation is shrinking the gap between real down and synthetic. In my closet right now, I have my ski shell by Mountain Hardwear which is waterproof and windproof, thanks to GORE-TEX. It is great for skiing or biking in winter and goes perfect over my Patagonia Down Sweater Hood Jacket. However, the warmest jacket is my Marmot Parka, known as my dog walking parka. Filled with goose down, it keeps me warm no matter the wind chill. Next to that coat in my closest is my Patagonia Adze and Nano Air Jacket. These two are my most versatile coats. On top of the Patagonia Down Sweater and Nano Air vests, let’s not forget about the fleece jackets and wool quarter zips. Last but not least is the Marmot PreCip Rain Coat, which is perfect for mild winter activities. You might be right if you are thinking I have a closet just for my coats. 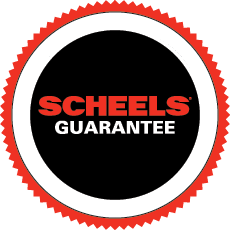 Stop in to your local SCHEELS store to talk to an Expert on which coat or jacket would be perfect to keep you warm this winter season!